Aikido is a self-defense system that mainly uses the power and dynamics of an attacker and uses it against him. 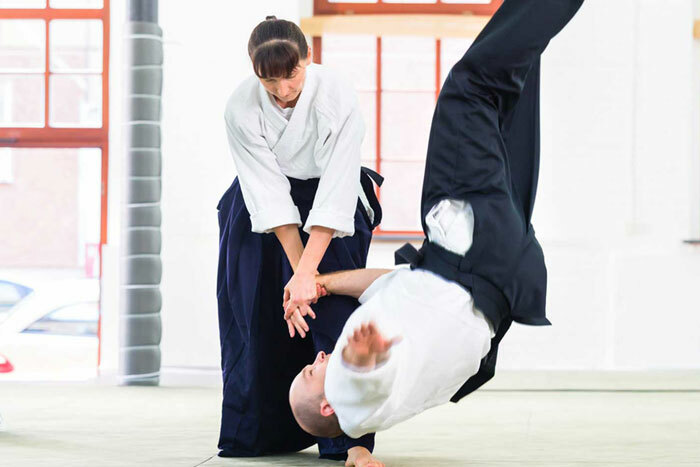 Aikido particularly emphasizes the importance of achieving complete mental rest and control of one’s own body and controlling attacks by an opponent. Aikido is a martial art from Japan. The word Aikido consists of 3 characters Ai-Ki-Do. Ai means harmony / unity, Ki means energy / life force and Do means the way / way of …. It is a martial art based on switching on instead of disabling the attacker. Aikido is sometimes translated as “The way of harmony”. The defensibility of Aikido is mainly in how we use the lessons in our daily lives. Instead of fighting against the stress and or the other we connect with it and add. This makes us resilient on a spiritual and physical level. The exercises in Aikido help us to find calm, harmony and balance. Aikido is a particularly beautiful martial art for children and teenagers. It is a non-violent, non-competitive martial art that focuses on harmonious movement of the body, balance and control instead of destructive striking techniques for self-defense. The children’s group consists of boys and girls from 5-6 years old until they feel too old for this group. All ages train together and help each other to learn. We have training etiquette that the student must adhere to. As soon as you can stick to this, and like to participate, you can train (of course if your parents like it too). Adult Aikido is from 16 years and there is no maximum age. If you are not yet 18 years old, you do need the permission of your parents to train. Arend Dubbelboer is the head instructor who gives most of the lessons. If Arend is not able to take care of the lessons, one of the other instructors will take over. Arend Dubbelboer has been training martial arts since 1980 and in his martial arts career has practiced many different martial arts. In 1990 Arend started with Aikido at Aalt Aalten, who put Arend on the path of martial arts in daily life. In 1996 Arend founded the company Aiki Management and started teaching martial arts to individuals and the business community. In 2004 Arend came into contact with the Systema and practiced Systema with Mikhail Ryabko and Vladimir Vasiliev. Arend is a passionate practitioner and teacher. The contribution for the Youth group (Emmen) is € 23, – per month. You can take 1 trial lesson and there are no costs involved. There are, however, some conditions to be able to participate in a trial lesson. You must be physically and mentally healthy or have permission from a doctor to train if you have a certain illness or injury. For youth Aikido we ask whether the parent (s) want to be there at least one lesson. So if you are interested you can send us an email and we invite you as soon as possible to participate. Before you join you will first have to take a trial lesson. This is both for you and for us, because we want you to know what it is all about. This trial lesson is also for the instructor to see if you fit in a group. After this trial lesson you can ask the instructor if you can become a member to participate weekly. If you agree, you will receive a registration form. On this registration form we ask for your contact information, but there is also a disclaimer and an automatic collection form.